Nestled down in the rolling hills along the scenic Niobrara River Valley near Niobrara, Nebraska is one of the most beautiful picturesque views you'll see. Here is the home to Kreycik Elk & Buffalo Ranch owned by Chris & the late Kenard Kreycik, Steve & Allison Kreycik and Clint & Stacy Miller. An animal lover by nature, Kenard grew up farming and ranching with his father and uncle then later he and his wife Chris took over the family farm. Kenard also loved the sport of hunting. A dream of his was finally fulfilled when he went elk hunting in the mountains where he was unsuccessful and returned home empty handed. Years later he heard of people raising elk and looked into raising his own elk. The excitement of bringing home his 1st cow and two bull elk,( with one being his first pet named "Jasper"), was overflowing in him. All the neighbors had to come and see what new hobby Kenard brought home. What started from an unsuccessful elk hunting dream turned into something he never would have imagined. As the elk herd grew Kenard decided to add a buffalo herd to his exotic animal ranch. The attraction of the elk and buffalo grew attention by word of mouth. Many people would drive for miles to come see "Kenard's wildlife". It wasn't long when a bus tour caught wind of the Kreycik's unique attraction which launched the idea of building a covered wagon to. The summer of 1995 the unique business of sharing their exotic animal venture with the public by way of a tractor pulled covered wagon was born. Today Kreycik River View owns two covered wagons that can hold 64 people, with one being handicapped accessible. Tourists are excited to ride in the covered wagons through the elk and buffalo pastures while a tour guide educates them on how the animals are raised and what the Kreycik's do with them. 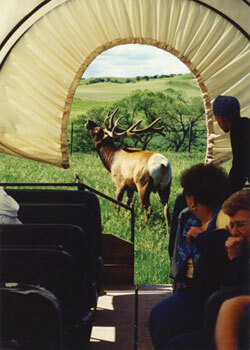 The most exciting part for tourists of all ages is when they get to hand feed elk and buffalo as well as pet the elk! Boomer, the long-horn steer who thinks he's a buffalo, lives with the buffalo and runs to the covered wagons as he knows the tourists are waiting to hand feed them.